A pretty quiet day spent mostly trying to photograph feet with only average success. A reasonable shot of Slewsay with front cannon bandages. The rules state that “standard bandages must be stitched the full length on the outside of the leg in contrasting thread”. If you look carefully you can see the stitching. In contrast Riviere was bandaged on the rear which is much less common and the bandages were of the self-adhesive type which may have “electrical tape applied at least two times around the circumference of the bandage”. As you know I’m not a fan of bandages and Riviere surprised by finishing second, whereas Slewsay finished last of the seven runners. Riviere’s placing was doubling surprising because if you look carefully you may detect traces of excrement on the bandages. A bad look! 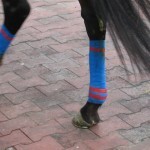 Neither horse was listed as bandaged on the official gear list. A reasonable shot of the glue ons on Beyond Pardon. 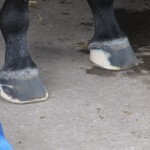 The contrasting glue colour suggests a good deal of side wall damage in the hoof. And a pretty comprehensive failure to get a shot of the tips on The Minster. Only two bets for a loser, Avionics, and a third, Future Solution. Here we go again. Bright-eyed and bushy-tailed for a New Year! 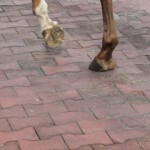 I regard horses that weave as not being completely settled. In fact they are probably worth a lay. Over Quota started favourite and pinged out in the middle of the field, raced mid-field, and finished mid-field. A veterinary inspection after the race revealed the horse to be suffering from respiratory distress.